In Pathways, we select an artist and follow their career In addition, we target as many recordings that they have been involved in as possible. In this issue. 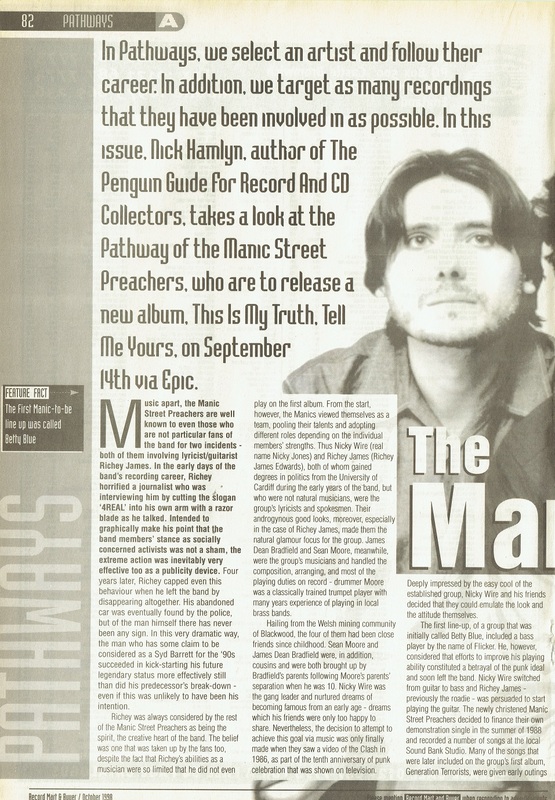 Nick Hamlyn, author of The Penguin Guide For Record And CD Collectors, takes a look at the Pathway of the Manic Street Preachers, who are to release a new album, This Is my Truth Tell Me Yours, on September 14th via Epic. Music apart, the Manic Street Preachers are well known to even those who are not particular fans of the band for two incidents - both of them involving lyricist/guitarist Richey James. In the early days of the band's recording career, Richey horrified a journalist who was interviewing him by cutting the slogan '4REAL' into his own arm with a razor blade as he talked. Intended to graphically make his point that the band members' stance as socially concerned activists was not a sham, the extreme action was inevitably very effective too as a publicity device. Four years later, Richey capped even this behaviour when he left the band by disappearing altogether. His abandoned car was eventually found by the police, but of the man himself there has never been any sign. In this very dramatic way, the man who has some claim to be considered as a Syd Barrett for the '90s succeeded in kick-starting his future legendary status more effectively still than did his predecessor's break-down - even if this was unlikely to have been his intention. Richey was always considered by the rest of the Manic Street Preachers as being the spirit, the creative heart of the band. The belief was one that was taken up by the fans too, despite the fact that Richey's abilities as a musician were so limited that he did not even play on the first album, From the start, however, the Manics viewed themselves as a team, poolinq their talents and adopting different roles depending on the individual members' strengths. Thus Nicky Wire (real name Nicky Jones) and Richey James (Richey James Edwards), both of whom gained degrees in politics from the University of Cardiff during the early years of the band, but who were not natural musicians, were the groups lyricists and spokesmen. Their androgynous good looks, moreover, especially in the case of Richey James, made them the natural glamour focus for the group. James Dean Bradfield and Sean Moore, meanwhile, were the groups musicians and handled the composition, arranging, and most of the playing duties on record - drummer Moore was a classically trained trumpet player with many years experience of playing in local brass bands. Hailing from the Welsh mining community of Blackwood, the four of them had been close friends since childhood Sean Moore, and James Dean Bradfield were, in addition, cousins and were both brought up by Bradfield's parents following Moore's parents' separation when he was 10. Nicky Wire was the gang leader and nurtured dreams of becoming famous from an early age - dreams which his friends were only too happy to share. Nevertheless, the decision to attempt to achieve this goal via music was only finally made when they saw a video of the Clash in 1986 as part of the tenth anniversary of punk celebration that was shown on television. Deeply impressed by the easy cool of the established group, Nicky Wire, and his friends decided that they could emulate the look and the attitude themselves. The first line-up, of a group that was initially called Betty Blue, included a bass player by the name of Flicker. He, however, considered that efforts to improve his playing ability constituted a betrayal of the punk ideal and soon left the band. Nicky Wire switched from guitar to bass and Richey James - previously the roadie - was persuaded to start playing the guitar, The newly christened Manic Street Preachers decided to finance their own demonstration single in the summer of 1988 and recorded a number of songs at the local Sound Bank Studio. Many of the songs that were later included on the group's first album, Generation Terrorists, were given early outings at this time, but for the single they selected the true-to-punk-prototype Suicide Alley, backed with Tennessee (I Get Low). James Dean Bradfield and Sean Moore played all the music between them at these sessions, but Nicky Wire stood with them for the cover photograph, which was taken by Richey James and showed a pose deliberately reminiscent of the cover of the first Clash LP. Two hundred copies of the single were pressed and given covers, while nearly another hundred had plain white sleeves. A tiny number had sleeves made by Richey James, using lettering cut from copies of NME stuck on to card. The band sent singles to other bands, in an effort to gain support gigs, and to record reviewers in newspapers and magazines. By this means, Suicide Alley was eventually given a rave review in NME, which must have helped the group sell the remaining copies through an advertisement in the paper's back pages. Nevertheless, the record has become extremely hard to find these days and collectors discovering a late passion for the Manics are likely to have to pay a three figure sum to acquire a copy with any of the sleeve variations. Another track from the Sound Bank Studio sessions was issued on a flexidisc given away with the fanzine Hopelessly Devoted. Two more were eventually issued on a limited edition single by Bob Stanley, synthesiser player with St Etienne, on his Caff label. The Manic Street Preachers' first London gig, in September 1989, was attended by the proprietor of the Damaged Goods label, who subsequently issued a four track 12" single, New Art Riot EP. In due course, the record through several pressings of a thousand copies each with a different colour label being used every time. Original copies, however, have black and white labels. One of these was sent to publicist Philip Hall, who was doing his best at the time to turn the recalcitrant Stone Roses into superstars. He was persuaded to go and watch the Manics in rehearsal and was sufficiently impressed to agree to become their manager. He threw himself into the role with considerable dedication, supporting the band financially to a level beyond his means, but seeing his faith in them justified when he managed to achieve a long-term deal with CBS-Sony. In the interim, the band signed to respected independent label, Heavenly, which released two singles. The seven tracks included on these continued the Manics' confident reworking of the punk style, but did so with an easy authority makes completely understandable the groups feelings that for the first time they had produced some recordings of which they could be totally proud. 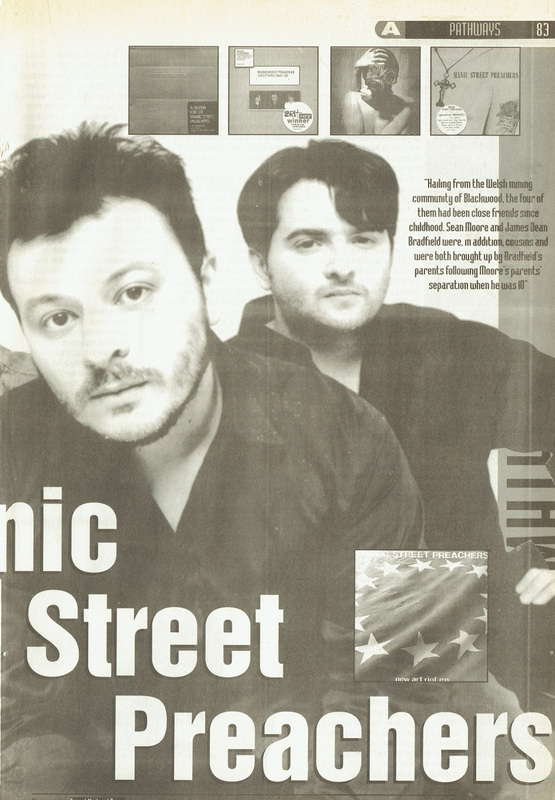 With the Heavenly recordings behind them, CBS-Sony was happy to see the Manic Street Preachers' success build slowly. But build it did, as each single in tum achieved a higher place in the charts, culminating in the cover version of The Theme From M.A.S.H", which entered the Top 10 in the autumn of 1992. Meanwhile, the group was adopting a highly confrontational approach to its PR. Taking the attitude that any kind of publicity was worth having. Nicky Wire and Richey James, as the groups spokesmen, threw out frequent quotable soundbites, often attacking their contemporaries with altogether more vitriol than should have been taken entirely seriously (most notoriously in the case of Wire's on-stage comment to the effect that they hoped Michael Stipe would die of AIDS in the same way as had Freddie Mercury). They suggested that their plan was to sell 16 million copies of their debut album and then split up - perhaps with the finality of a self-immolation carried out live on Top Of The Pops. At the Same time, they were fond of lacing their outrageous statements with quotes from the likes of Sartre and Nietzsche, while their chosen scene-setter on stage, at least in the early days, consisted of a reading from beat poet Allen Ginsberg's long avant-garde work, Howl. In the '60s, when similarly intellectual and politically-motivated groups like the Deviants, the Fugs and even the Doors and Jefferson Airplane, could exhort their fans to "loot the supermarket" and could contemplate lining their opponents "up against the wall" to be shot, critics understood well the value of shock tactics in rock and were used to coping with the literary and other references. But they understood too that tactics were what such statements were. 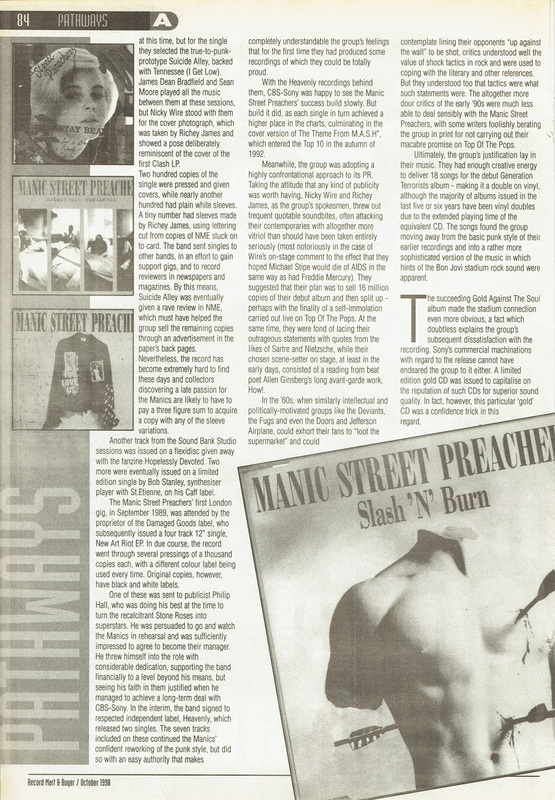 The altogether more dour critics the early '90s were much less able to deal sensibly with the Manic Street Preachers, with some writers foolishly berating the group in print for not carrying out their macabre promise on Top Of The Pops. Ultimately, the group's justification lay in their music. They had enough creative energy to deliver 18 songs for the debut Generation Terrorists album - making it a double on vinyl, although the majority of albums issued in the last five or six years have been vinyl doubles due to the extended playing time of the equivalent CD. The songs found the group moving away from the basic punk style of their earlier recordings and into a rather more sophisticated version of the music in which hints of the Bon Jovi stadium rock sound were apparent. The succeeding Gold Against The Soul album made the stadium connection even more obvious, a fact which doubtless explains the groups subsequent dissatisfaction with the recording. Sony's commercial machinations with regard to the release cannot have endeared the group to it either. A limited edition gold CD was issued to capitalise on the reputation of such CDs for superior sound quality. In fact. however, this particular 'gold' CD was a confidence trick in this regard, consisting as it did of the normal silver-coloured surface on a CD that was merely made out of yellow plastic. The music, however, is magnificent through much of its length, with James Dean Bradfield putting to good use the meaty sound obtainable from his expensive new Gibson guitar. At the end of 1993, Philip Hall died of cancer. The group was devastated at the loss of a man who had become a friend as well as a manager, and none more so than Richey James. The mental instability suggested by the 4 REAL incident increased markedly from this time. On stage in Thailand he appeared with his chest slashed, while his subsequent slide into alcoholism and anorexia became so acute that he was forced to undergo a lengthy spell of treatment in a psychiatric clinic. The rest of the group toured without him, but recorded a third album, The Holy Bible, whose generally dark mood was set both by Richey's behaviour and his own bleak lyrics. The music was much less easily likeable than that of its predecessor, and had none of the stadium flourishes, but it was played with the authority of a group that knows it has found its own distinctive style. After Richey James' disappearance, the rest of the Manics felt at first that they should disband. 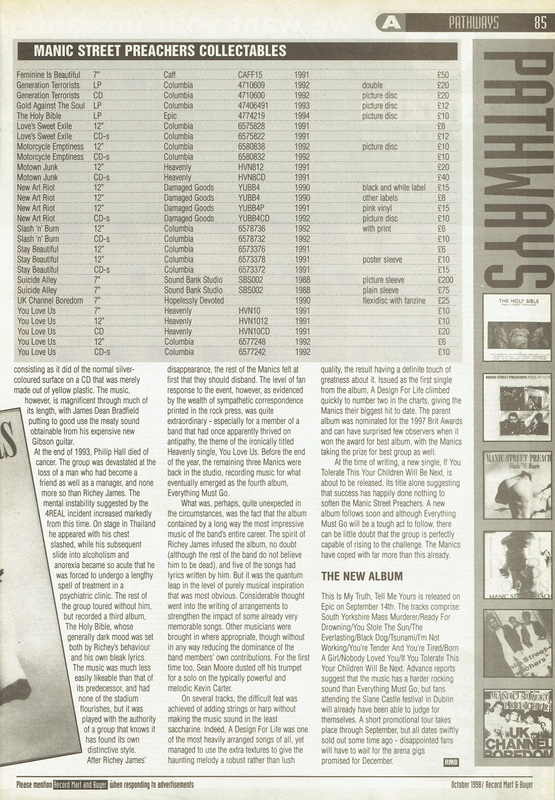 The level of fan response to the event, however, as evidenced by the wealth of sympathetic correspondence printed in the rock press was quite extraordinary - especially for a member of a band that had once apparently thrived on antipathy, the theme of the ironically titled Heavenly single, You Love Us. Before the end of the year, the remaining three Manics were back in the studio, recording music for what eventually emerged as the fourth album, Everything Must Go. What was, perhaps, quite unexpected in the circumstances, was the fact that the album contained by a long way the most impressive music of the band's entire career. The spirit of Richey James infused the album, no doubt (although the rest of the band do not believe him to be dead), and five of the songs had lyrics written by him. But it was the quantum leap in the level of purely musical inspiration that was most obvious. Considerable thought went into the writing of arrangements to strengthen the impact of some already very memorable songs. Other musicians were brought in where appropriate, though without in any way reducing the dominance of the band members' own contributions, For the first time too, Sean Moore dusted off his trumpet for a solo on the typically powerful and melodic Kevin Carter. On several tracks, the difficult teat was achieved of adding strings or harp without making the music sound in the least saccharine. Indeed, A Design For Life was one of the most heavily arranged songs of all, yet managed to use the extra textures to give the haunting melody a robust rather than lush quality, the result having a definite touch of greatness about it. Issued as the first single from the album, A Design For Life climbed quickly to number two in the charts, giving the Manics their biggest hit to date. The parent album was nominated for the 1997 Brit Awards and can have surprised few observers when it won the award for best album, with the Manics taking the prize for best group as well. At the time of writing, a new single, If You Tolerate This Your Children Will Be Next, is about to be released, its title alone suggesting that success has happily done nothing to soften the Manic Street Preachers. A new album follows soon and although Everything Must Go will be a tough act to follow, there can be little doubt that the group is perfectly capable of rising to the challenge. The Manics have coped with far more than this already. This Is My Truth, Tell Me Yours is released on Epic on September 14th. The tracks comprise: South Yorkshire Mass Murderer/Ready For Drowning/You Stole The Sun/The Everlasting/Black Dog/Tsunami/I'm Not Working/You're Tender And You're Tired/Born A Girl/Nobody Loved You/If You Tolerate This Your Children Will Be Next. Advance reports suggest that the music has a harder rocking sound than Everything Must Go, but fans attending the Slane Castle festival in Dublin will already have been able to judge for themselves. A short promotional tour takes place through September, but all dates swiftly sold out some time ago - disappointed fans will have to wait for the arena gigs promised for December. This page was last modified on 22 May 2018, at 06:15.